You suspect you’re a little over the limit, but you convince yourself to drive like you did when you took your licensing test, keeping everything upon the roadway slow and deliberate. There’s even the ridiculous claim you tell yourself: “I drive better when I’m drunk.” This fallacious belief comes from the idea that a person will put greater effort into driving safely when they’re intoxicated so as to avoid detection by the police. Sadly for many of these people, they quickly become victims of self-delusion. Police zero in on several driving behaviors that an individual may not even realize they’re engaged in. Ultimately, these behaviors are what land over a million people in jail for DUI every single year. Wide turns are one of the most telling signs that a person is under the influence. An intoxicated driver often thinks they’re avoiding detection by ensuring that they don’t hit a curb when turning. Unfortunately, due to impaired motor skills, this often leads to excessively wide turns that quickly tip police off. Speeding is a common violation that attracts police. But they know drivers who’ve been drinking want to avoid any infractions that can be compounded by a driver’s alcohol intake. Thus, police recognize slow vehicles as a possible sign of an intoxicated driver. Additionally, studies have shown that alcohol impairs a person’s cognitive reasoning, so they may not even realize just how lightly they’re depressing the accelerator. The simple truth is that alcohol impairs a person’s ability to react quickly. This means that a sudden red light or just-noticed stop sign can force an intoxicated person to brake abruptly; they don’t want to attract police by running a stop sign or committing another traffic violation. Unfortunately for them, sudden braking gives officers more than enough probable cause for a traffic stop. As mentioned, alcohol impairs a person’s cognitive function. 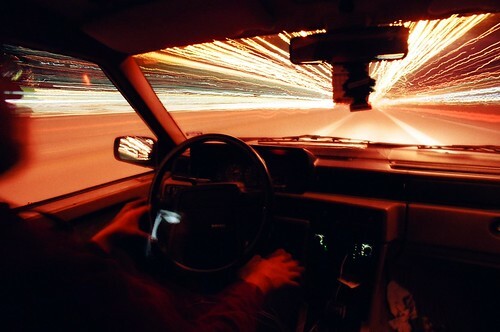 Many times the outcome of this is failure to realize the dark of night is better navigated with the help of headlights. This is actually a very common trigger for DUI stops. Sure, most people think “I’ll always turn on my headlights,” but when alcohol has caused a level of impairment, rational thought becomes difficult. Though it is a regrettable pun, driving into oncoming traffic is a dead giveaway. It’s very risky to operate an automobile going north when the flow is south, or vice versa. This is yet another behavior that most people can’t imagine being susceptible to, not even after some alcoholic refreshment. Sadly, alcohol is involved in about a third of all traffic fatalities, and head-on collisions comprise about 10 percent of fatal crashes. Since head-on collisions account for only about two percent of all accidents, you can see the role of alcohol impairment – it skyrockets your chances of driving on the wrong side of the road, unaware through inebriation. It becomes obvious how dangerous these wrecks are when a person compares the aforementioned 10 percent to the fact that head-on collisions only account for two percent of all accidents. Unfortunately, cognitive impairment may ensure that an individual doesn’t even realize they’re on the wrong side of the road. Driving under the influence is risky. It can become expensive, and possibly deadly. The precautions you believe you are taking are filtered through a brain altered by alcohol. Dire consequences frequently result, possibly the least of which is the DUI arrest. It’s not simply speeding drivers that alert police; officers are trained to detect all sorts of peculiarities. You can easily tell when they recognize one of these operational gaffes – there are whirling blue lights reflected in your rear-view mirror. Teresa Stewart found an abundance of helpful information at http://www.kellislaw.com, the website of Steve E. Kellis, Philadelphia, Pennsylvania, in compiling this report.